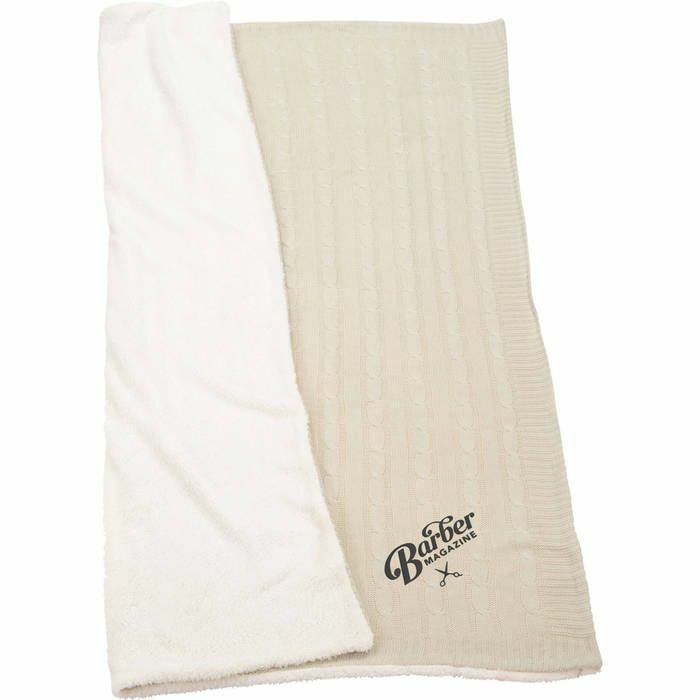 Cable Knit Sherpa Blanket features a classic look with timeless style. Super soft and cozy, a perfect luxurious comfort. Note Embroidery up to 7,500 stitches - no extra charge. The maximum imprint area may not be reached w/ 7.5K stitches for some artworks. Each 1,000 stitches, if needed, will be $0.40 extra per pcs. Blankets can be embroidered with individual names / initials - please specify names/initials, font, and font size in Text Box in Artwork Section if embroidering individual names or initials. Names Requirements Fonts allowed: Helvetica or Times New Roman; font size: 24pt - max. of 17 characters including spaces, font size 36pt - max. of 11 characters including spaces. Imprint Area Open corner bottom,Centered 6" up from corner (diagonal orientation) 4.00" H x 4.00" W Embroidery up to 7,500 stitches - no extra charge. Each 1,000 stitches, if needed, will be $0.40 extra per pcs. Setup Charge $25.00 per color/location.